Is the housing boom already over? Did home prices peak before summer? Well, a new report from Redfin revealed that competition among home buyers eased in May, which may be an ominous early sign of what’s to come. The company noted that 69.5% of Redfin real estate agents that wrote an offer last month faced competition from another agent, which while high, was down from 73.3% in April and well below the 2013 high of 79%. Additionally, the percentage of homes that received multiple offers was nearly at year-ago levels again, when the number was 69.3%. 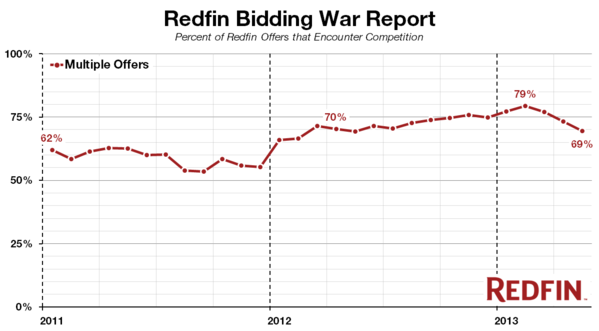 Meanwhile, 49% of Redfin’s winning offers were above the original asking price, down from 51.9% in April. Why Is the Housing Market Cooling Again? If this report was for June, as opposed to May, one could look to the higher mortgage rates as a potential housing market buzz killer. But these are the May numbers, when mortgage rates were still relatively low for a decent chunk of the month. So the obvious issue is an increase in inventory. Housing inventory always rises in spring as it’s the start of the traditional home buying/selling season, and that’s exactly what happened this year. In April, the number of homes for sale increased 6.4% month-over-month, the largest monthly increase since March 2010, when the homebuyer tax credit was phasing out. At the same time, inventory was down 26% compared to April 2012. Home buyer demand was also down, with home tours and written offers slightly lower in May, per Redfin. Of course, housing demand is definitely local, with Los Angeles and San Francisco still red-hot in terms of competition, while San Diego and Orange County saw significant month-over-month declines in interest. And not every major market is seeing home prices go for well above the asking price, despite all the rosy media reports. While that was the case in a staggering 96.8% of properties in San Francisco, which on average sold for 9.7% above list, just 19% of winning offers went above ask in Chicago. In some major metros, including Baltimore, Chicago, Los Angeles, and Washington D.C., the average difference between offer price and asking price was actually negative. Now we’ve got the prospect of even more homes coming to market, coupled with significantly higher mortgage rates. As I’ve noted in the past week or so, mortgage rates are about 1% higher than they were a month ago, so there’s definitely going to be some kind of effect, though it’s too early to tell what that may be. Plenty of pundits think housing can recover in the face of higher mortgage rates, even with rates in the 5-6% range. But others are questioning the entire rally now that rates have begun to tick up, calling the recovery nothing more than a weak attempt to keep home prices inflated. In any case, competition will remain elevated, even if not at levels seen earlier this year. As you can see, government loans have fallen out of favor with prospective home buyers, most likely because of the recent increase in annual FHA mortgage insurance premiums. Additionally, many FHA loans now require insurance for the life of the loan, which clearly isn’t economical, let alone feasible for many would-be borrowers. 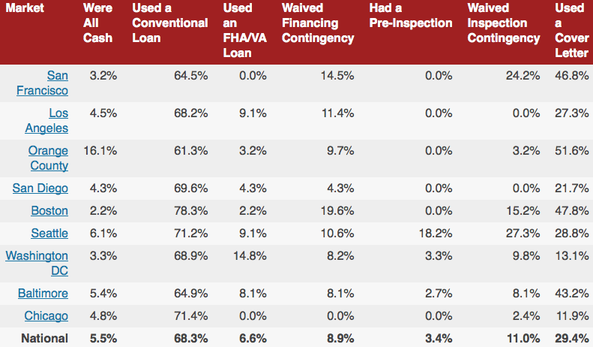 Both FHA and VA loan volume decreased from April to May, accounting for just 8.5% and 6.6% of winning offers, respectively. Meanwhile, all-cash offers grabbed a 5.5% share of the market, up from 5.1% in April – 16.1% of offers were all-cash in Orange County last month, up from 9.7% a month earlier. What this all means is that if you’re a seller, you better get on it, as things appear to be trending down. And if you’re a prospective buyer, you might be able to bide your time, though you’ll have to contend with the prospect of rising rates. 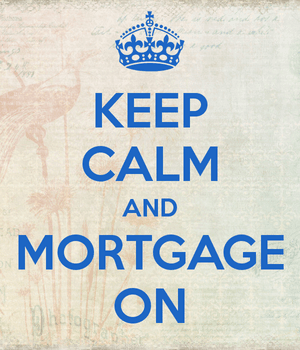 Read more: Slowing mortgage market could lead to looser lending.